Most business transactions require a document or a piece of paper to make the transaction formal. It is an important ritual for both parties, so that each has proof that such transaction actually took place. The easiest way to accomplish this is to use an pdf in invoice. There are actually different types of an invoice depending on the nature of the transaction. There is medical invoice, travel invoice, and even plumbing invoice. All of these have each of their separate purposes with one common denominator. They all follow a certain standard when it comes to the elements that should be included in it. In order to create a payment invoice, you need to familiarize yourself with how a simple invoice is created. There are elements that you have to include which is essential in every invoice. Include the seller’s details. The seller’s details should include the business’s or owner’s name, address, and contact details. This should be written on the topmost part of the page. Add the buyer’s details. Just below the seller’s information should be the buyer’s printable invoice details, like the name, address, and contact number. Specify purchased items/services. This refers to the goods or services that were purchased or availed by the buyer. Write the description, amount, as well as its corresponding unit prices as applicable. Writing a payment invoice for services is just the same as an ordinary invoice for physical commodities. There are certain business transaction invoices that are solely dedicated for services like plumbing and construction invoice. The invoices that are for services contain an adequately detailed description of the services that were availed by the customer. You need to specify what type of work was delivered successfully; for example, changing of pipes or room wiring. Then, indicate the labor fees for that certain service. Of course, aside from that, you also need to write the provider’s details as well as the customer’s. 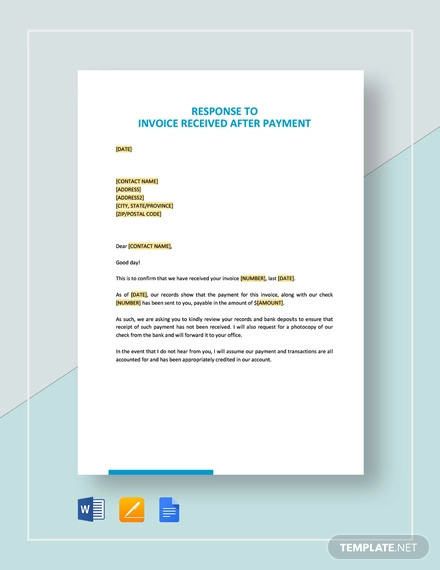 A payment invoice is a document that contains the list of the services or goods that a customer availed or purchased, as well as the payment made and the mode of payment. It is an official document that serves as a proof of payment for a certain product or service. Since it is considered as an official document, it needs to have not just the elements of an invoice but also terms and conditions. However, terms and conditions are always set by the business establishment and is regulated by the department in charge of trade and industry of the country. The most common terms and conditions are directed towards the use of the product and requests for refund. We cannot help but encounter products that are defective right when we purchase them. Although we cannot immediately see them sometimes because there are certain products which you cannot test or try unless they are paid. So in the payment invoice form, it is oftentimes stated the conditions of requesting refunds or replacements. For example, a common practice is that the defected product should be reported at least two weeks from date of purchase. Once returned, the store can inspect the product and provide necessary decisions whether it requires a refund or replacement, so long as it meets the stated terms and conditions.